Everything has been done, and then some! You don't have to do a thing! She is ready to sail. This is the best maintained and upgraded Morgan 41 Classic on the market today and has been incredibly well taken care of by her astute owners. 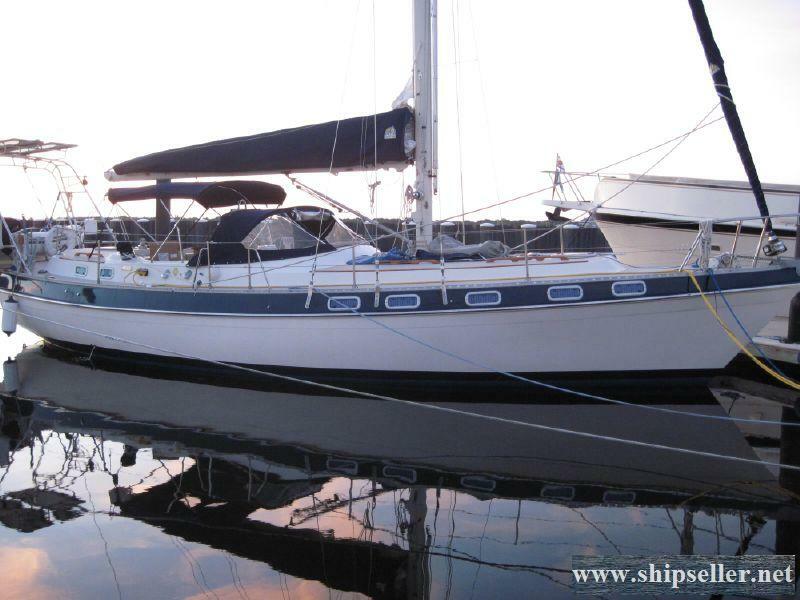 Unlike the Out Island series, the Classic boasts a much more modern underbody and simplified sailplan, and is easily handled by one or two persons. You will not be dissappointed with this amazing vessel. Fresh water maker - Sjpectra 300, 2011 fully automatic water-maker unit with only 18 hours of production at 12.5gals/hr. Solar panel - Lippincott custom welded stainless Arch with Davits and Solar panels that will handle new Frig. 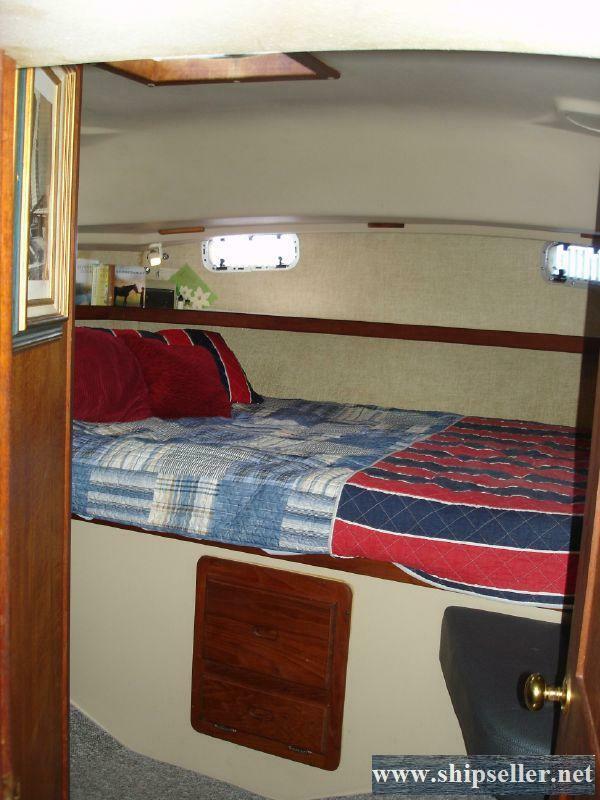 "CAVU" features a traditional center cockpit interior, beginning with a large V-berth forward cabin with drawers and hanging locker to port. There is a private door to the forward head compartment as well as second door from the main salon. Opposite the head compartment is another hanging locker with shelf above. Aft is a straight bench settee, while opposite is an L-shaped settee that doubles as the dinette. There is a large dinette table that folds vertically against the main bulkhead, keeping the salon spacious and open while up. There is generous storage outboard and below the settees. 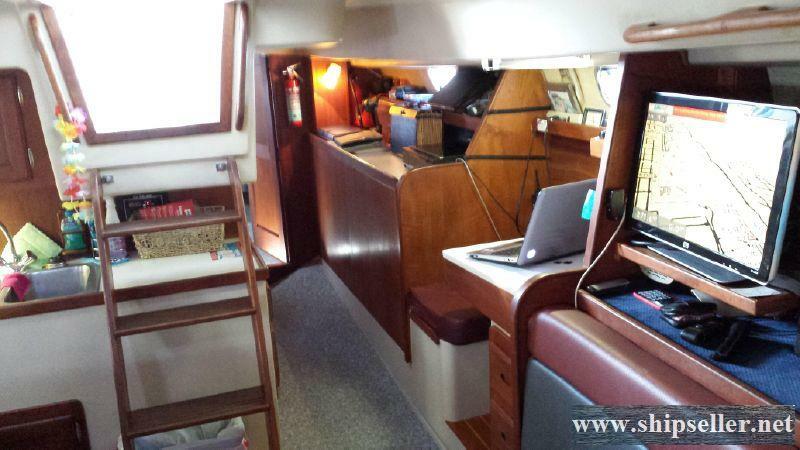 Aft of the dinette is a U-shaped galley,(salon seats 6) while opposite is the chart table. Moving aft along the port side walk-thru is a long counter, with water tank beneath, and a door to the machinery room inboard. Entering the aft cabin there is a large hanging locker to port, another to starboard, a queen athwartship aft berth, and an ensuite head/shower compartment. 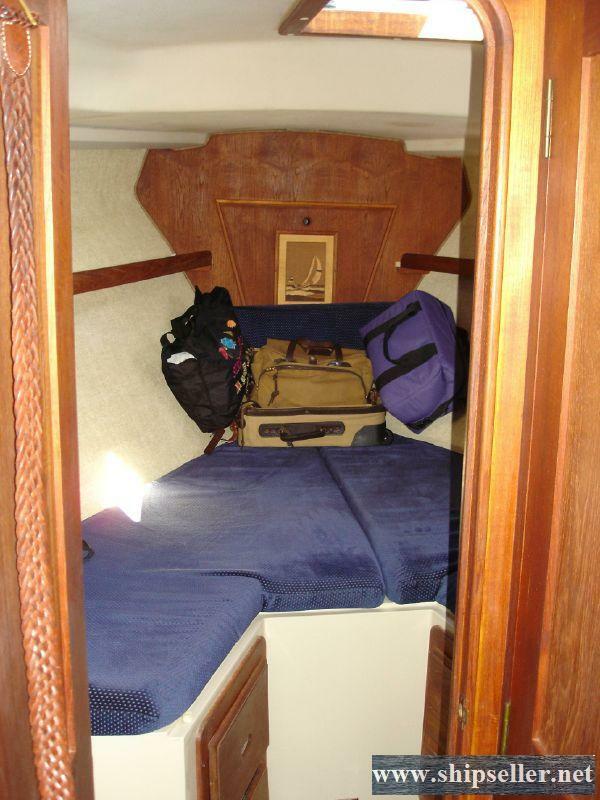 There is a varnished teak & holly cabin sole in the salon and galley, carpet in the sleeping cabins and walk-hru covering a textured fiberglass sole. Interior woods are all solid teak and teak veneers. 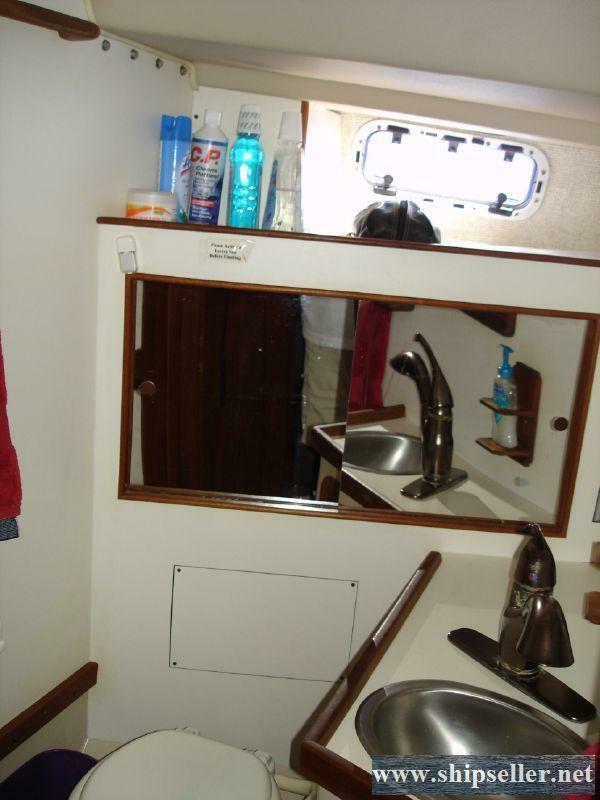 A large U-shaped galley to starboard of the companionway. 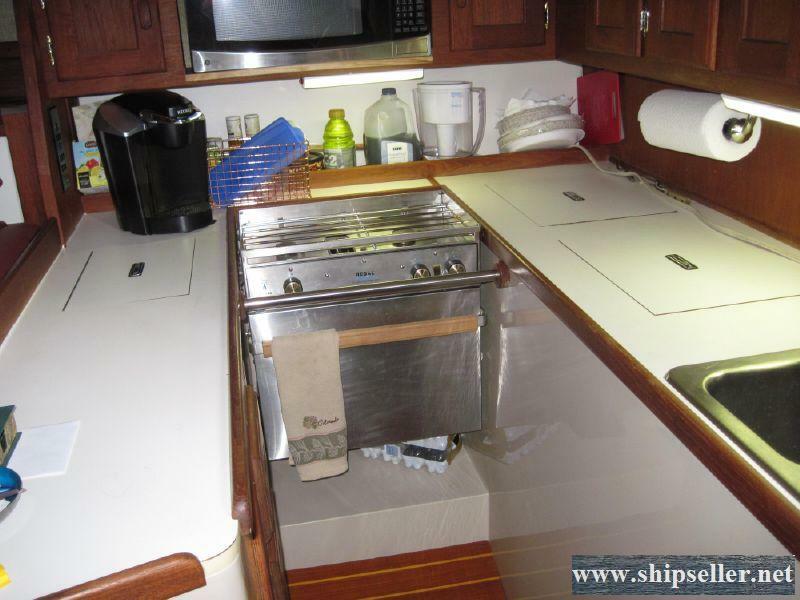 There is a large athwartship countertop forward with drawers and locker storage and outboard is the 2-burner Propane stove, and above the stove is a GE Profile microwave. Along the aft countertop is the separate refigeration and freezer lockers, double s/s sinks and additional counter space. 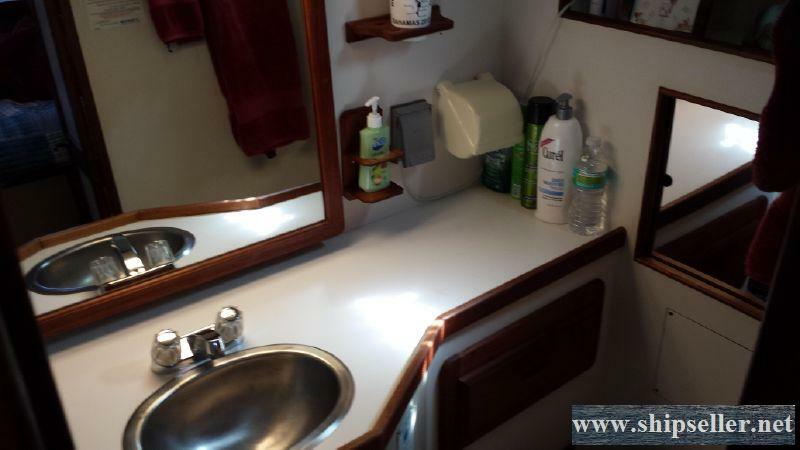 The galley is such that whether at sea and underway or at a tranquil anchorage, the chef will appreciate its design and functionality as well as the ample storage and meal preparation space. The Morgan Classic hull design is a departure from the venerable Out Island series. 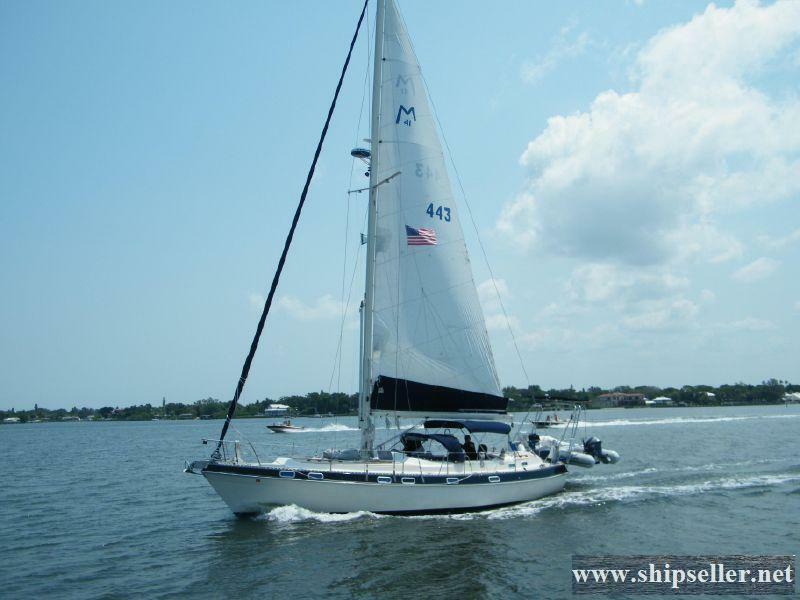 The hull is solid hand laid GRP construction with molded keel cavity, internally ballested. The underbody configuration is more of a modified fin keel with a cutaway forefoot, cutaway aft of the keel then a full skeg to mount the rudder on. The prop is in a aperture between the skeg and rudder. There is a full length molded rub rail with a s/s striker rail. The deck is molded as one piece GRP construction with molded non-skid with an slotted aluminum toe rail along the hull-to-deck joint. Outboard chainplates combined with wide side decks make fore and aft movement safe and unencumbered. Jay Sturt electric windlass. All new lines replaced in 2011, with mostly all hard rigging replacements in 2011. New Furlex system forward and replacement of most lifelines. All manual winches:2-52 Lewmar S-T for jib line, 1-40 Lewmar S-T for mainsail, 1-new 30 Lewmar S-T for main halyard, 1-16 Lewmar for spinnaker haylard & jib halyard with clutch on mast for both lines, and 1-16 Lewmar for 3 reefing lines. Boom-Vang attached to mainsail boom. 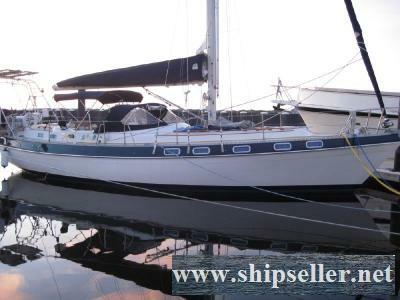 UPS asymetric custom-built for CAVU, with built-in furling system. This is the hottest new sail being built for cruisers because it has a continuous furling line and can be handled by one crew member.